â€¢ As a VJing tool, using an audio input through mic or any other Audiobus compatible App. â€¢ As a sound creation tool, with the default empty shader so you won't be distracted by any visual animation. â€¢ Or in its full potential for true audiovisual composition. â€¢ Import from iTunes File sharing, Audioshare, Audiopaste or "Open in..." from any app with Export functionality. â€¢ The initial version of K Machine comes with more than 30 default vertex shaders, and 4 commented shader examples. â€¢ No limitation ! Import your own visuals, with the "Open in.." feature, use any external code editor App with Export functionality to create your own vertex shaders files. â€¢ A simple line of code allows the creation of up to 8 parameter controllers for each vertex shader. â€¢ Each loop can have its own BPM. â€¢ Each loop can have its own number of beats. â€¢ Events can be splitted in 1/3, 1/5 1/7 or 1/11 ! â€¢ Simple click on the 'video capture' button starts live video recording of your ongoing session with zero drop in performance. â€¢ Ableton link Ableton link: synchronise with any Ableton link app. 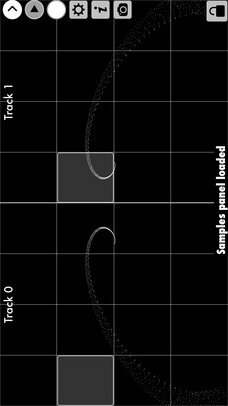 â€¢ Audiobus Remote: control K Machine from another device. â€¢ Audioshare: import edit your own samples with Audioshare. â€¢ Audiopaste and Audiostore: import sample with Audiopaste and/or browse an amazing sample collection through the Audiostore.